My Life is a perpetual photobomb. I’m Heather, aka Sprittibee, and I’m one of the founding members of this sisterhood of North American homeschooling mamas. We don’t turn anyone away for geography… but we are mainly a North American group. Our Facebook group is open to homeschooling families and we are a FREE online “co-op” where moms and kids can fellowship, show-and-tell, and share the ups and downs of their every-day adventures as homeschooling families. Are you a “mulberry mama” like me? A little bit on the crazy side – loving nature, loving yummy home-cooked food, seeking a slower life, full of books and learning and time to savor the important things that God blessed you with? Do you have sticky, barefoot, messy, crazy kids that match their pajama-clad homeschool mama with food on her shirt? Then, you’re the kind of mama I’m looking for! YOU are my people. 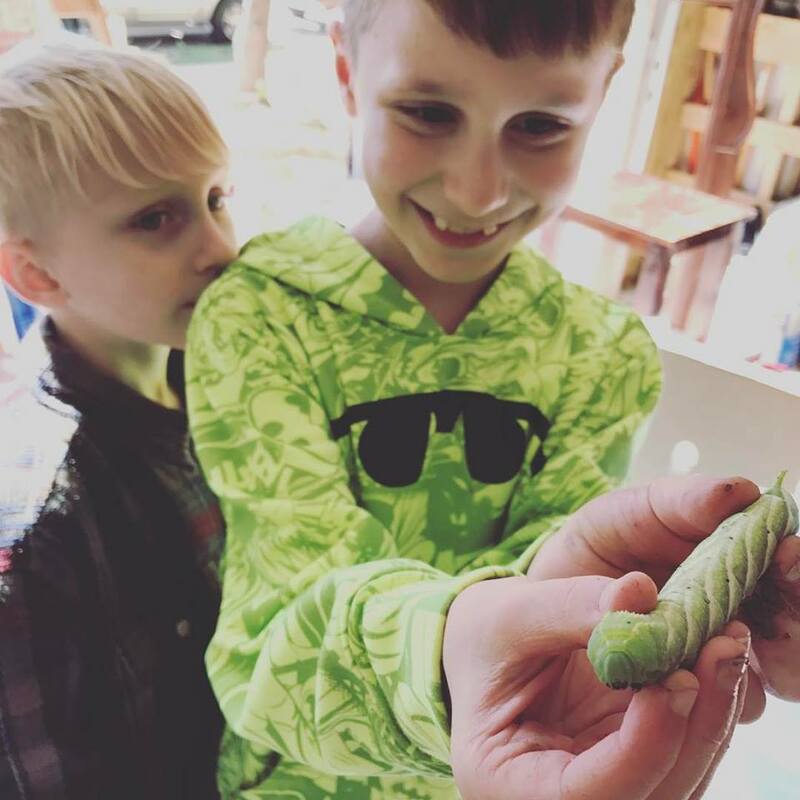 The Mulberry Mama blog and group began out of my need for a homeschool online co-op for my little boys who are 9 and 7… and the fact that we are moving out to the country to live far away from civilization. Who knows whether there are any viable co-ops out there in the sticks, right? Farm life and homeschooling are both hard enough… it would be awful to have no friends to share life with. Scrolling through Instagram one night I discovered a feed for Mulberry Mamas because I was posting a photo of myself dangling precariously out of a mulberry tree with a bucket of berries. 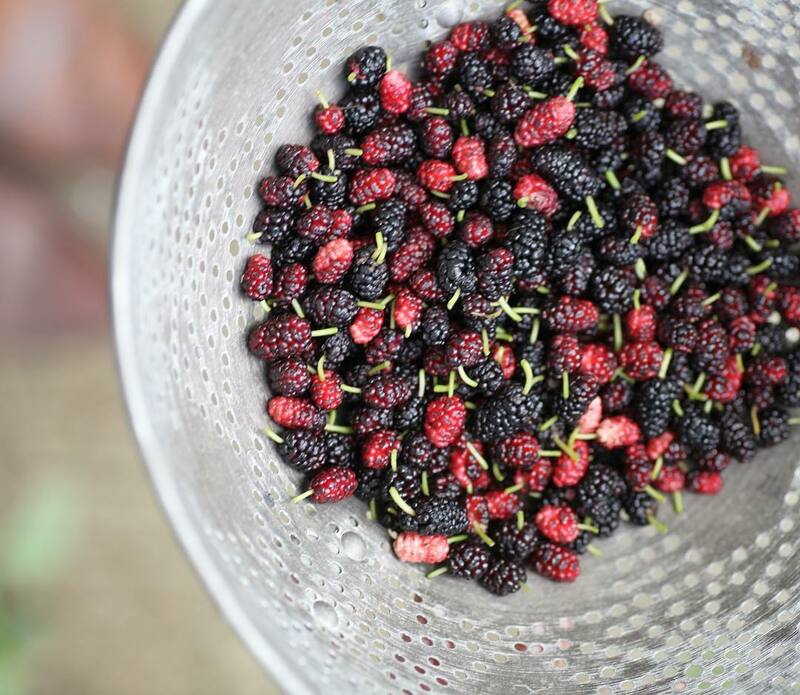 I’m the original #mulberrymama and spent a good part of the past few springs collecting and finding ways to eat thousands upon thousands of mulberries because God happened to grow them for me in my back yard. You know they are a superfood, right? Just like us homeschool mamas – supermoms in the making… with super kids. So WHAT is a Mulberry Mama? I thought I’d give you an idea based on who I am… Someone who loves creation – nature – beauty – and the possibilities of the creative child’s mind. Someone who believes childhood is precious and should be protected. Someone who loves a free-thinking mind and the ability to tailor education to a child’s bent. Someone who has their own passions and never stops learning or being teachable. Someone who seeks the truth and chases after simplicity and meaning. Someone who tries to be a good steward of not only the children she’s been blessed with, but all things – up to and including the mulberries in the back yard. When life gives her mulberries, she finds a Pinterest recipe and nails it! 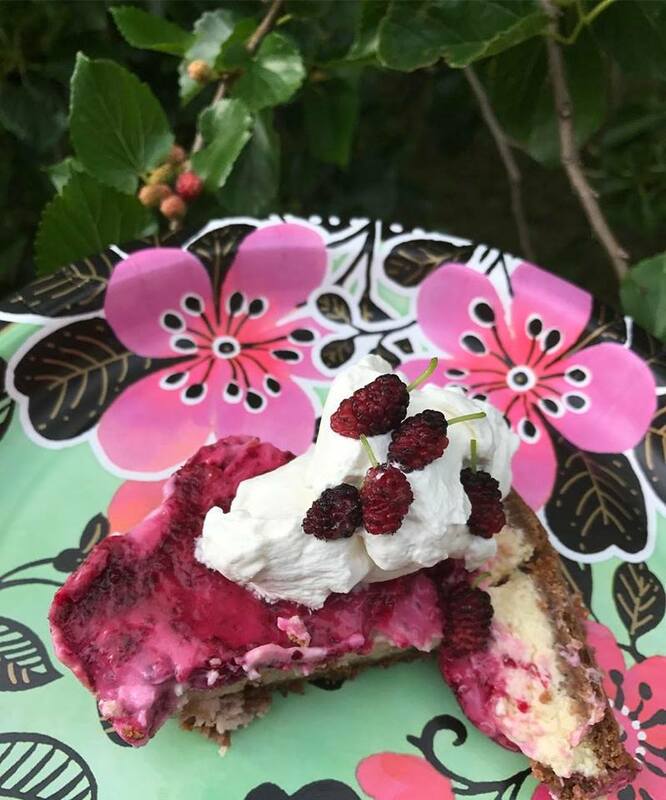 When life gives you mulberries… make gluten-free, sugar-free cheesecake. Is this sort of like you? I mean, you don’t have to be wearing the crazy socks, the cowgirl boots, the ancient red Crocs, or the apron… but do you have a passion for homeschooling, learning, reading, educating, gardening, animals, nature, field-tripping, happy … sticky… dirty… busy children? I know I’m not the only one. I’m so glad you’ll join me in sharing the “fly-on-the-wall” everyday ups and downs of this homeschool life we’ve all chosen. Consider this group your teacher’s lounge… your mom’s fellowship… your sisterhood. You ladies are my people. We welcome any homeschool mama who is currently homeschooling at least one kid, and interested in an online support group based in North America to join us. My kids are in the 1st through 4th range, but we accept any ages who are interested. You can even get teens involved if that inspires you or them. All the kiddos who participate will be learning computer skills without trying and making awesome and fun connections. Think of this co-op as an online “teacher workroom” where we can share our thoughts on our private (closed) facebook group and we can share highlights on our instagram hashtags. For the kids it will be more of a school hallway where their work is framed and hung in rows. Can you picture it with me? Oh, how proud they will be to see their moms bragging on them! Once a week, or as often as you want, we plan to “show and tell” our highlights, share our “fly-on-the-wall” homeschooling lives with each other, and encourage and hold each other accountable in our group. Our kids can get excited to do their very best and show it to their new virtual friends each week. Who knows, maybe this will be the FIRE under their pants to get them excited about digging in this school year?!?! Those who really are interested in making this a thing can also submit photos and writing samples of their work for this homeschool mama-led group blog… and serious mamas who are wanting to be a part of this regularly can offer to be writers here. NOTE: This is not a “how to homeschool blog”; aren’t there enough of those? This is a family project and a place to be encouraged and inspired… NOT a ball and chain commitment or a burden on anyone. I can see our little kids laughing and chatting and “oooing” and “ahhhing” over each other’s awesome projects and pictures. I can see them learning about each other’s states, maybe swapping post cards, or even meeting up IRL one day in the real world. Who knows… maybe forever friendships will be birthed – not just for the mamas, but for the kiddos! The worst thing that could happen is they might be motivated to get a little more work done with less fuss. We all know that teaching is the highest form of learning … and preparing work to “show and tell” is sort of like teaching what you’ve learned! It makes the thing you learned stick forever like SUPER-GLUE in your brain. For the moms, it’s just great to have some encouragement, a springboard for ideas, a mentor, a friend, and/or just someone to tell you it’s ok to skip a few pages in that lesson planner before you need psychiatric help. Homeschool mamas need each other. We need our tribe. I’m a mulberry mama… I’m seeking the slow, nourishing, healthy, homeschool life. Are you? Some of the mamas who will be blogging here are artists, creators, photographers, designers, and crafty types who wish to bless your socks off. Be watching for them to offer you things that make your homeschool mama heart go pitter-patter. I would insert a heart emoji, but I don’t have one on my keyboard. BY THE WAY: The group is open to any type of homeschooler, and it makes no difference what curriculum – or lack thereof – is being used. Unschooler? Come on. Uber-organized, scheduled, box-set, textbook curriculum user? Bring it. Come one, come all. This is not a place of judgment. We don’t care what brand of essential oils you use, either. Not gluten-free? Who gives a flip? We still love you. Another note: You must also be responsible for monitoring your children online – but you already knew that. All information shared on the group will be closed and private, so please no sharing in-group info outside of the group. Also, if you have interest in blogging or being an admin for the Facebook group, I could use the extra hands and brains and talents as you desire to serve with them. If you are interested and your kids are wanting to learn more about photography, writing and basic computer skills, we can also make this into a fun way to share our projects and learning all year. Nature pics, art pics, projects, what we are learning (mini articles), etc. – these are all great ways to document our learning and we can use them to create scrapbooks or portfolios to keep, too. We welcome your amazing ideas to make this school year more fantastic-er. I’m excited about having a virtual co-op this year to learn and pray with, aren’t you? It won’t matter if you stay in your pajamas. We don’t care. 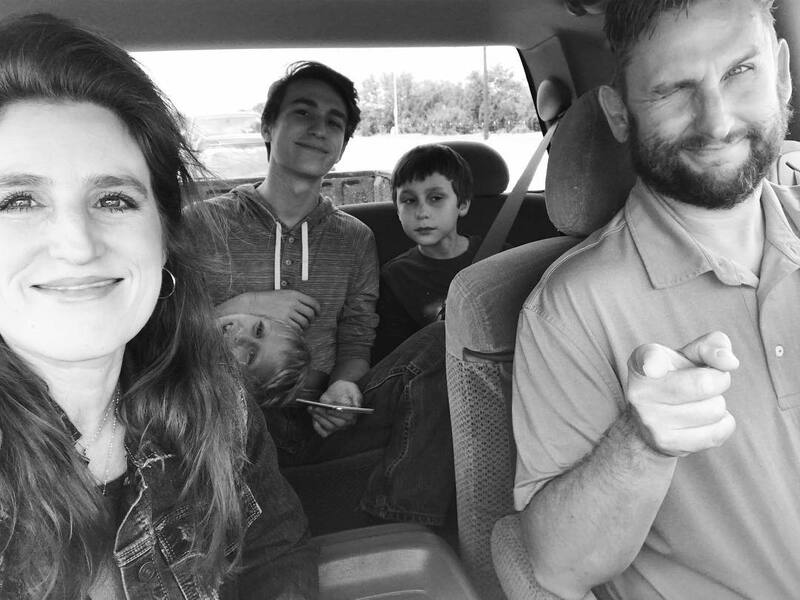 Mulberry Mamas will make schooling more fun for my boys, add an element of accountability for mama and them, and it will make it exciting to see what other homeschool families are doing each week all around the continent…. not just mama scrolling through instagram before bed anymore… but the kids getting involved and engaged as part of our learning experience this year. WE START SCHOOL SEPTEMBER 4TH and we END on June 14th…. but the fun doesn’t have to ever stop. Heck, I’ve been homeschooling since 2001, and it hasn’t stopped yet. Join us as we kick off our very first weekly updates next week! I hope to see you there. Request to join our group and we will get you set up and ready to go! Credits: I have to give a little credit for the inspiration for this to the Australian Mulberry Magazine which I stumbled upon while using the #mulberrymama hashtag on instagram. I was quite literally talking about being a mulberry mama because I am crazy enough to spend two and a half months climbing my mulberry tree for berries and making my boys help as part of their homeschool PE, home ec, lifeskills, science, nature, and nutrition lessons for homeschooling. Read: child labor (of love). Finding out that there are other mulberry mamas in the world made me think: HEY! We need to band together and revel in our shared homeschool weirdness! It’s great to be understood. Big thanks to Mulberry Magazine for their vision and I hope we can bring a little American and Texas flare into the insta-feed and help grow their mulberry childhood movement all around this shiny, blue planet! Our American group will be using the #mulberrymamas and #mulberrymamas_us hashtags – but feel free to cross-post and share your awesome with our sisters and brothers down under. The more homeschoolers there are in the world, the better it will be.